Fine powder pigments for metallic and pearly effects on a wide range of surfaces - just mix with an appropriate glue or varnish for your medium. The range includes metallics, pearlescents, interference pigments and duo-colours, which show a different colour depending on the angle of the light. Choose from single bottles or the popular sets. Mix with Jacquard Gum Arabic if working on paper/card or most other surfaces, and with Jacquard Textile Color or Neopaque Colourless Extenders. It can also be mixed with other artist mediums, oils, acrylics, encaustic, Dorland's Wax, polymer clays, or spread dry on porous surfaces. 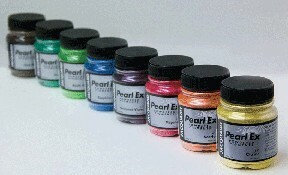 Pearl Ex Powdered Pigments were specifically developed as an art material, they are NOT for cosmetic use. Use on clay, polymer clay, encaustics, paper, shrink plastic, leather, glass, canvas, wood, and more.